Napkin rings can make or break the style of a table setting. A simple metal napkin ring says one thing, while a bold statement floral piece like this one says another. Flowers are happy, bright, celebratory and particularly good for adorning springtime meals. These napkin rings take such a short time to craft that there's really no excuse for not making them part of your table decor. 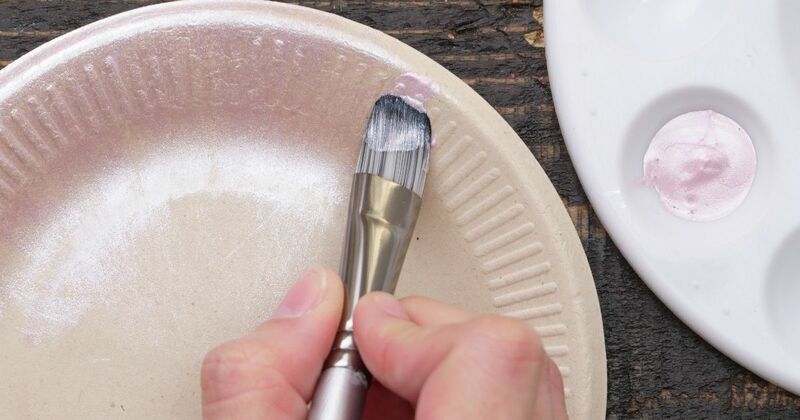 Plus, you'll learn how to take a basic paper plate and transform it into something elegant. Many paper-plate crafts use the center of the plate, leaving the edges to go to waste. In contrast, the ridged edges are exactly what make this flower special. There's no waste at this dinner table! 1. Lay the paper plate flat. 2. Lightly paint the entire surface with luminescent pink pearl acrylic paint. 3. Cut off the rim of the paper plate, trimming as little as possible all the way around and leaving the ridged edges of the plate exposed. 4. Cut four vertical lines along the ridged edges, from the outer edge of the plate toward the center, making sure they're evenly spaced (as if you're cutting a pie). Leave an approximately 1-inch circle in the center without cuts; don't cut across the entire plate. 5. You now have triangles (pie slices). Cut parallel lines within each of those triangles to create smaller triangles within each triangle. Each line should be short enough so that no part of the plate comes apart from the rest of it; you're just creating cuts that separate one part from the next. 6. Repeat step 5 so that you have two parallel lines on the inside of each pie slice's edges. 7. You now have short parallel cuts between the longer "pie slice" lines. They are grouped in twos. Cut inverted triangles on each of those strips, from the outer edge to the bottom of each ridge on the plate, creating points that poke outward like the petals of a flower. 8. Repeat step 7 on the remaining strips, cutting them a bit deeper into the plate to create bigger "petals." 9. Roll the edge of one petal around a pencil to curl it. Repeat all the way around, curling some of the petals more than the others to create an organic look. 10. Use tweezers to remove one adhesive gem from its wrapper and place it gently but securely in the center of the flower. 11. 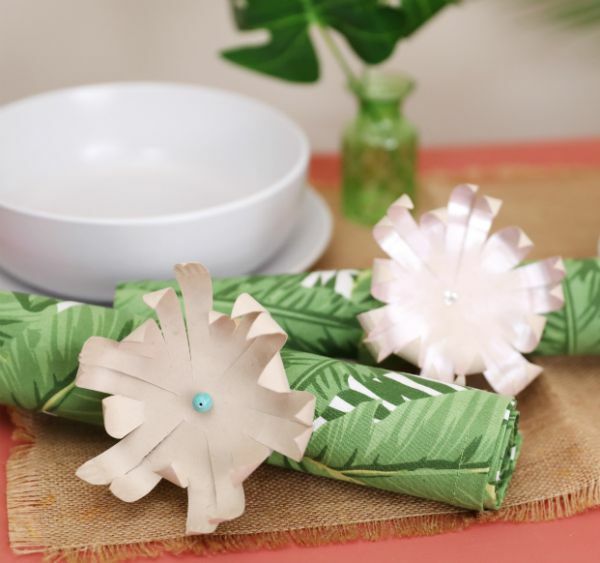 Apply hot glue to the back of the paper-plate flower, then adhere it to the top of the wooden napkin ring. It will look like a big ring with a flower on top. 12. Place each napkin ring around a napkin.